Okay, we just couldn't leave our vintage drum machine obsession alone (well an obsession with all things beat based really). So here's another couple of old timers to add to the collection. 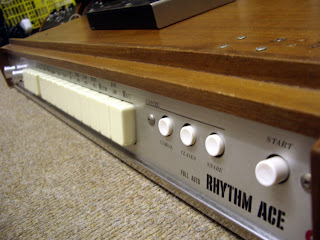 The larger wooden box (which is frankly huge, it's designed to sit on top of an organ - no sniggering at the back) is a 1969 Acetone (founded by Ikutaro Kakehashi who went on to start Roland) Rhythm-Ace FR2. This was an Ebay bargain featuring all the usual preset suspects (tango, bossa etc) and allows the muting of cymbal, clave and snare. Also like many of these vintage machines, it allows more than one preset to be pressed at once to create some interesting patterns. The kick on this old beauty is fab, although the cymbal sound is a real dog! The smaller silver box is a bit of an oddity, a 12 pattern preset drum box made in the 70's by stompbox kings Electro Harmonix - a Rhythm 12. Although made later, the Acetone pees all over this little box sound-wise, it dones have a certain charm (a reggae preset and a chicken-head knob! Yes, we're easily pleased). All of these vintage beasts will be featured in a forthcoming Future Music sample commission and we love 'em.